Wire Fox Terriers, generally healthy dogs, can suffer from the same ailments that any pup of any breed might suffer from. For example, heart disease, heartworms, and some forms of cancer are a few health complications that could plague any canine, purebred or otherwise. However, Wire Fox Terriers also have a few breed-specific health conditions that could complicate their overall quality of life. Deafness, for instance, is a birth defect that is common in Wire Fox Terriers. Vets think that this defect is associated with the mutation of DNA in interbred or overbred Wire Fox Terrier bloodlines, but no one is 100% sure of the definite cause. Deafness can affect one or both ears, but there is no way to know if a pup is deaf until it reaches the age to be attentive and hear. Purebreds with this condition can still live a lengthy, healthy life, but training has to focus more on visual cues, such as basic sign language, rather than verbal commands. This condition occurs when the kneecap dislocates from a groove in the thigh bone. It can be somewhat painful, and dislocation is random, but the subtle symptoms might include an awkward gait or obvious limp. Surgery is absolutely required to correct this health issue permanently. If left untreated, it could result in nerve damage and painful, lifelong arthritis. Other health concerns that could affect your Wire Fox Terrier include juvenile cataracts, lens luxation, Legg-Perthes disease, and cherry eyes. The average Wire Fox Terrier has a lifespan of 10 to 13 years. Loveable, excitable, and friendly, the Wire Fox Terrier is a sweet, playful pup who needs lots of attention. No busybodies need apply when it comes to the care and companionship of this pup. These purebreds are prone to separation anxiety, which can lead to depression and destructive behavior. He needs constant love and attention, so make sure you have the time and commitment to give a Wire Fox Terrier beforehand. 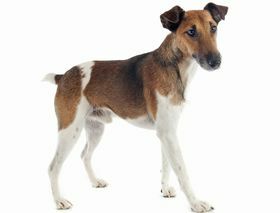 Wire Fox Terriers have a chasing instinct that applies to small animals, such as cats, squirrels, and chipmunks. These pups rarely do harm to anything they chase, but it might be a challenge to keep an excitable pup from bolting down the street at high speeds after a small animal. This is where training comes in. It is highly important that you begin training the Wire Fox Terrier from a young age. Use patience, praise, and positivity to instill in him acceptance, tolerance, and obedience. The Wire Fox Terrier is a rambunctious, boisterous, bouncy pup, especially in the puppy years. These purebreds need lots of exercise to relieve their pent-up energy. A fenced-in backyard would be ideal because there is a ton of space to run and romp around. But make sure the fence is high and deep, as these purebreds can jump high and dig deep for more space to explore. Dog parks would also be great for well-socialized and trained Wire Fox Terriers. But, on rainy or cold days, a few walks around the neighborhood and indoor playtime will suffice for exercise. 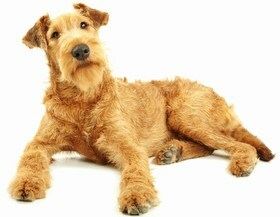 Wire Fox Terriers are hypoallergenic, but their double-coated fur is dense and sometimes curly. Use a comb to unkink any knots, then go back over his fur with a brush. Be gentle when you brush a Wire Fox Terrier, as their skin beneath the coat is sensitive. Schedule baths for every 6-8 weeks with a gentle dog shampoo. 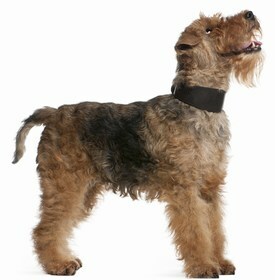 Or, take your Wire Fox Terrier to a professional groomer for a thorough wash, brush, and trim. Other basic care requirements include clipping his toenails every 2-3 weeks, cleaning his ears once a week, and brushing his teeth daily. 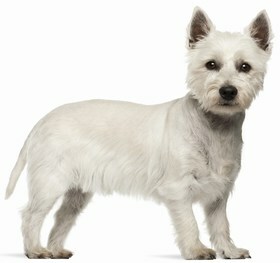 You should also make it a point to trim up his fur every 6-8 week to prevent split ends and mats. Wire Fox Terriers are average eaters with average appetites. These pups do well on a feeding schedule where you divide 2 cups of dry, high-quality kibble into 2-3 meals per day. The separation of his meals will help him remain full and satisfied throughout the day. This scheduling method also eliminates begging and cuts down on the risks of food aggression because your Wire Fox Terrier knows when his next meal will be. Looking for a Wire Fox Terrier? Wire Fox Terriers are a popular purebred, so you should have lots of luck finding your new companion. But check a local animal shelter first. There are plenty of abandoned Wire Fox Terriers who would love to have a new, happy, healthy home. And you could provide that for them. Adoption fees range from $75 to $250, but vaccinations and a spay or neuter service will drive the cost upwards of $400 to $500. Opting for a breeder? 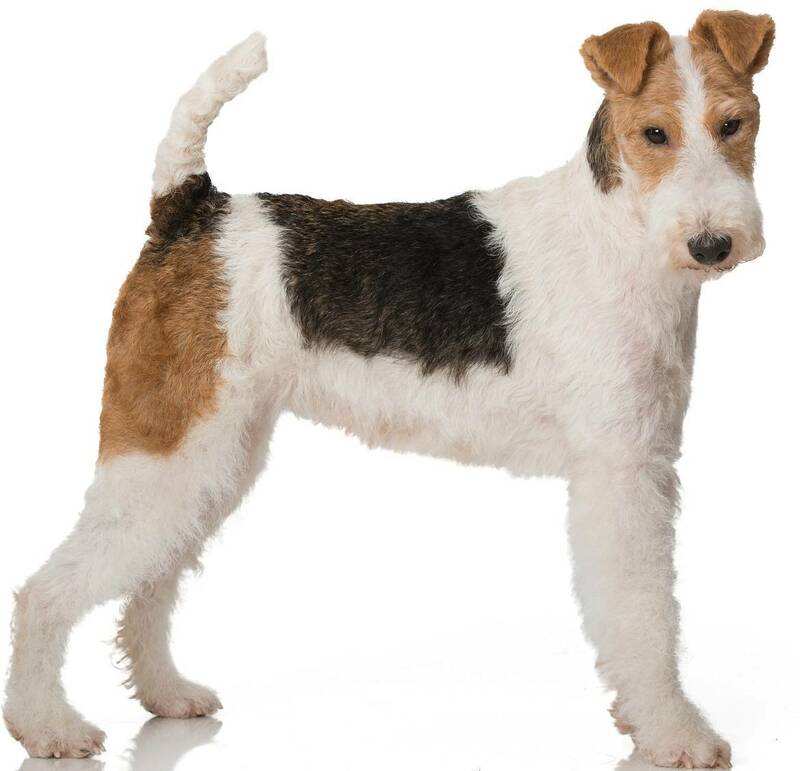 Check around to ensure the trustworthy, reliable reputation of any breeder before you invest in a Wire Fox Terrier. Ask to see the parents for any obvious health conditions. Then ask for AKC guarantees, a health contract, and bloodline documentation to check for interbred or overbred complications. On average, if you find a reputable breeder, Wire Fox Terrier puppies cost between $800 to $1,000. For pure bloodlines and show-quality dogs, you can expect to shell out somewhere around $1,400 or more. Be sure to also factor in long-term costs, such as toys, kibble, regular vet visits, and a professional groomer or trainer (if necessary). Ranking takes into account a few basic factors including cost, skill level needed, high vs low maintenance and how critical regular training is to success. Wire Fox Terriers are a 1.5 on the integration scale. These pups are friendly, loveable, and excitable, but their natural instinct to chase animals can be a frustration to pet owners. Simply remember to train and socialize your Wire Fox Terrier from an early age, and keep a positive tone and patient outlook during those training sessions. In a few months, you could have a well-trained, good-behaved purebred and family companion.